Nubart – the Audio Guide that you can Keep. We enable museums, sightseeing tours, monuments, natural parks and any visitable site to offer audio-guides without dedicated devices nor developing expensive apps. An attractive branded card with a unique code is the visitor’s gateway to rich content. Visitors listen to audio tracks directly on their smartphones. Our innovative audio-guides are inexpensive and profitable for the museum. Even for temporary exhibitions! Museums get great insight through visitor usage data and feedback. In 2019 we also sponsor the content production! CLICK ON THE PHONE IMAGE to see how our audioguides work. At Nubart we try to improve usability and navigation as much as possible. Visitors to a museum belong to all kinds of audiences and generations. At Nubart, we also want people who are not used to the digital world to know how to intuitively use our audio guides from their mobile phones, without having to receive instructions at the museum reception desk. That's why all the content appears on the same page, without external links, without the need to type and without having to open new windows. By scrolling down to the end of the audioguide you will find the feedback form. Leave us a comment! Museum visitors don’t want nor download apps. Nubart is a digital audio-guide, also a physical card, but not an app. You give us with the script and we take care of translations and voice overs. We sponsor most of the production! Open air exhibits? Archeological sites? Our optional geolocation feature will help your visitors to find their way. Your place has a bad data coverage? That's ok, since our audio-guides can also work offline. Up-front costs are low, so you can give audio-guides for free or sell them for a profit. Quick ROI. Traditional audio-guide devices consume valuable resources in a museum. They must be repaired, charged and kept clean. They also need to be picked up at the end of the tour. To ensure that they are returned, the visitor usually has to leave cash or a personal ID as deposit, with all the potential risk to security and data protection that this poses to the museum, to say nothing of the hassle for the visitor. Nubart audioguide cards are tangible like conventional equipment, but they don't need any maintenance. Since visitors can keep them, they don’t require a deposit to be lent out. 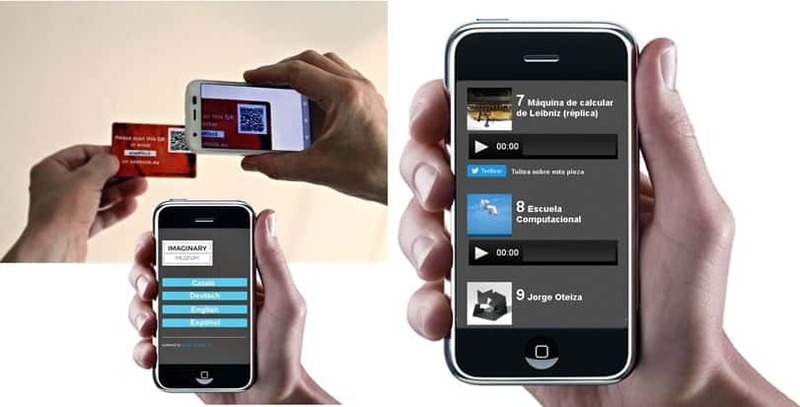 They work as a key that allows controlled access to the multilingual content directly from the visitor’s smartphone. They are also attractive and a nice collectible souvenir. Museums moving on from traditional devices tend to consider native apps as an alternative to conventional audio-guides. However, development of an app is expensive and the software companies tend to leave the digital content production to the museum. Apps need to be developed at least twice (iPhone and Android), are generally not flexible for content changes and require constant maintenance and expensive updates. Visitors often dislike consuming memory on their smartphones to install an app that they will probably only use once. The consequence is a very low download rate and hardly any ROI for the museum. 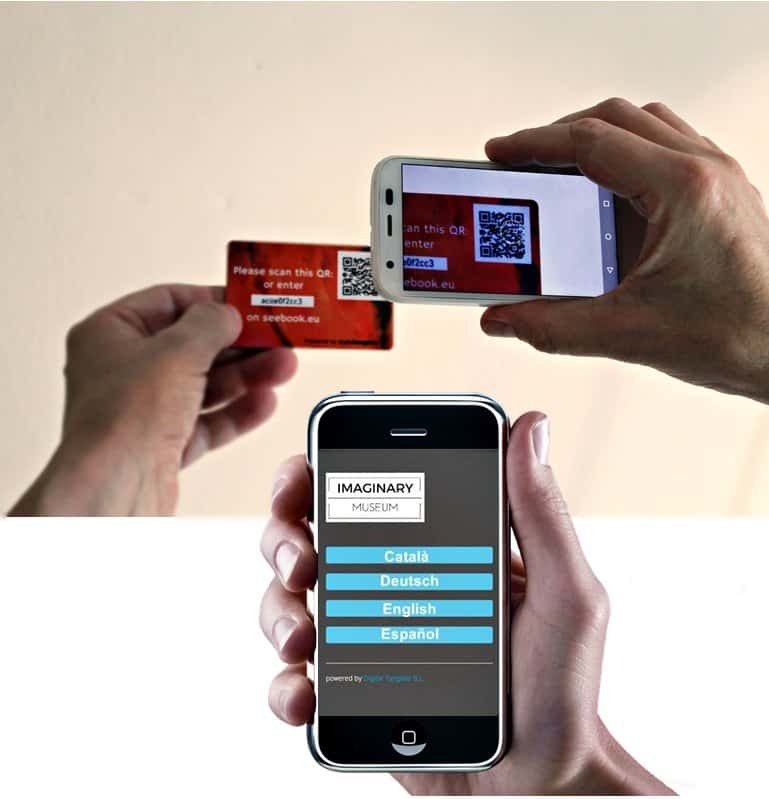 Nubart cards can be activated instantly from any type of smartphone (iPhone, Android, Windows…), even from old models. No updates required! Nubart doesn't consume the device's memory, since the digital content is streamed. We can also offer an offline solution for special cases. If your museum is facing production of an audio-guide for the first time, you may feel overwhelmed by the many things you need to take into account. How to write an appropriate script for an audio-guide? How many tracks should your audio-guide have? How long should they be? But also: how to find a reliable and professional translator into Chinese? Or who could make a professional voice over for your Japanese visitors? Many IT companies will offer you a technical solution (apps or similar), but will leave you alone with all content-related trouble. Nubart works with proven experts with humanities and arts backgrounds in all these areas, so we can offer you both: innovative audio-guide technology and first-class content production. 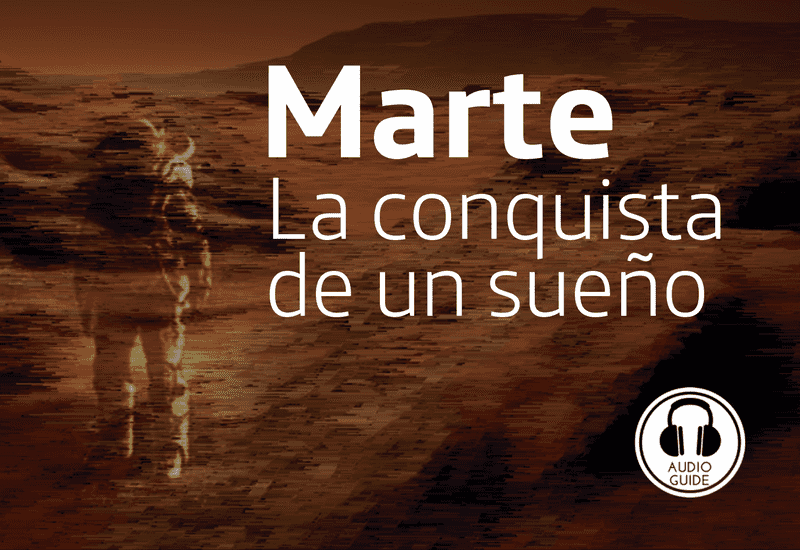 We collaborate with you at every step, from the script until the final presentation of the digital content. Museums know how important data about their visitors are. But it is difficult to gather this kind of quality data. 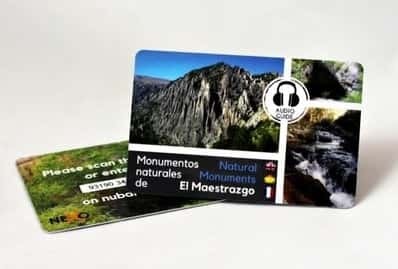 Nubart cards are not only an innovative audio-guide which provide a multilingual self-guided tour to your audience, but also an ideal data collector. In contrast to most other solutions, Nubart gathers usage and behavioral data from your visitors' smartphones anonymously and never violating their privacy. (See our Data Policy for Nubart's Audio guides). By learning which tracks have been listened to the most, you will know the real, objective interests of your visitors. With this knowledge your museum can plan future purchases or optimize accompanying material. Since every card has a unique code, we can do data mining for you. For example, we can answer questions like: "How many French visitors came to my museum during the afternoon?". Or: "let me know if the track Nr. 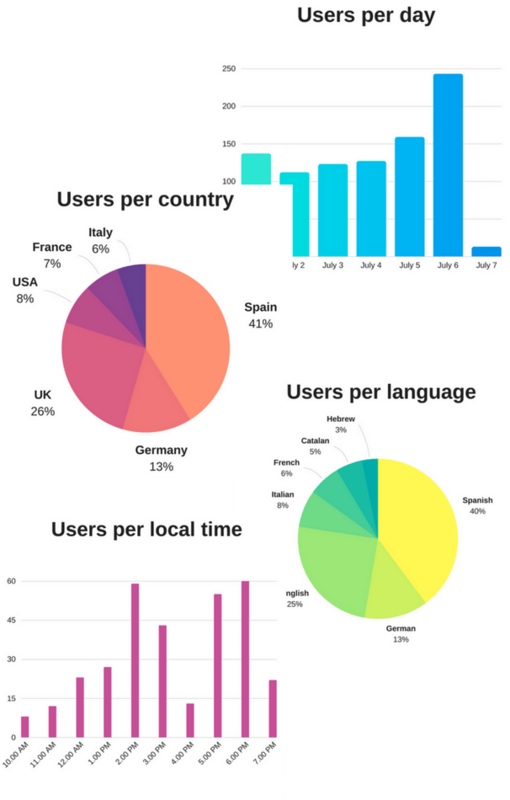 14 has been more listened to by Japanese then by Chinese visitors". (Please note that these customized datasets are not included in our free reports). 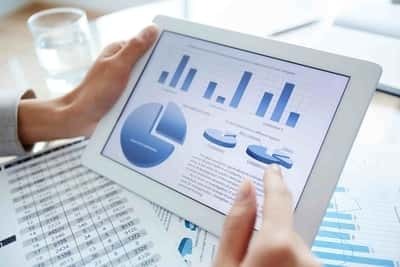 Our free data reports collect a lot of anonymous information about your visitors and their behavior. But certain important information can not be retrieved automatically, so you need to ask your visitors to provide it to you. general scoring of the exhibition from 1 - 5.
a text field for comments about the exhibition or about the audio-guide. You will be surprised at how thorough these visitor comments can be, even typed on the small smartphone screen! The museum can receive visitor comments in real-time by email. 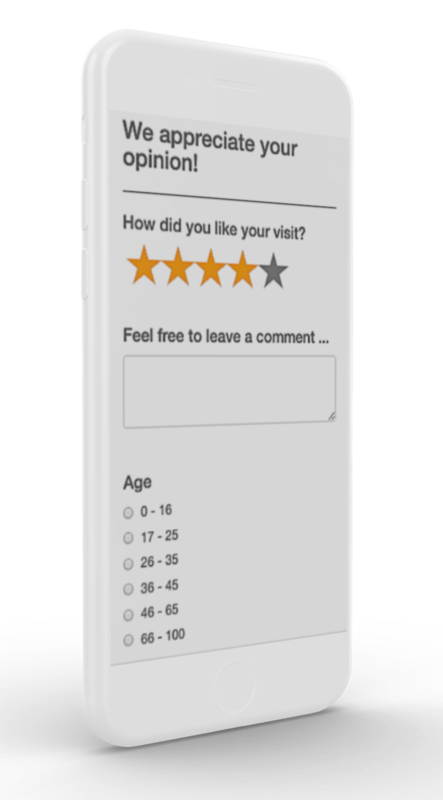 Additionally the museum can select three more questions from a list of options, allowing you to know things like age, gender or even the email address of your visitors, as long as visitors choose to share this info to you. Thanks to our unique code system, the visitor can only answer the questionnaire once, ensuring the quality of the data. Incomplete answers are also captured. The response rate of our feedback form is 14 %! Are you planning a guided city-tour? Does your museum have some exhibits in open spaces? Would you like to have an audio-guide for a natural park? Our audio-guides can integrate maps and also geolocate points of interest. 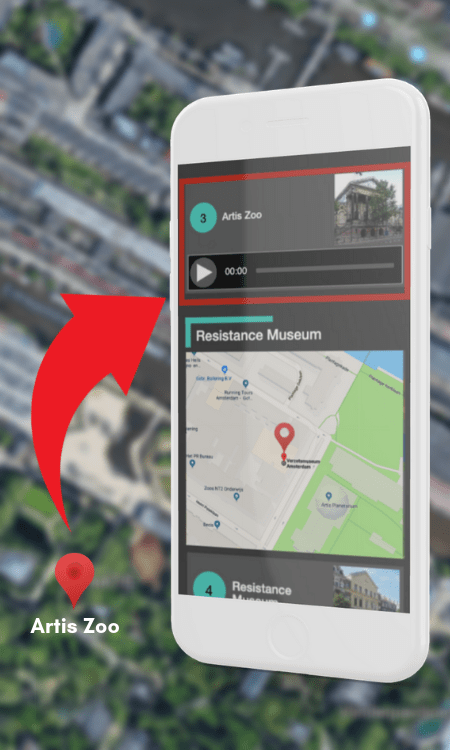 Our geolocated audio tracks light up in red and scroll automatically to the top of your mobile screen as you approach the exhibit or location. In Android, this process is enhanced by a slight vibration of the mobile phone. In this way, your visitor always knows which track she is supposed to listen to next. Whether she wants to click on it or not is up to her: our tracks do not play automatically to enable a non-intrusive functionality. Our geolocation also works in offline mode! Our audio-guide in offline mode (ie without internet or data coverage), is ideal for museums that only have free Wi-Fi in the lobby or for audio-tours in areas with poor or no data coverage. 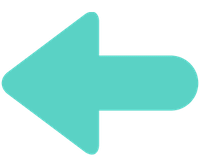 The first access (scanning the code) should take place in an area with connectivity. All digital contents of the audio-guide will be temporarily downloaded to the visitor's smartphone. No need to install an app nor to consume memory! From this point on, the content can be heard in offline mode for as long as necessary. 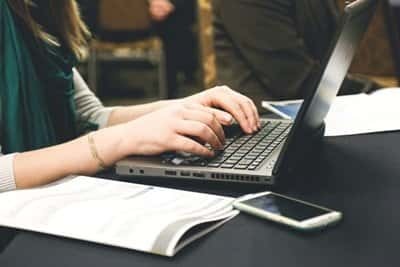 By closing the browser, the content will disappear automatically from the smartphone, but it can be accessed anytime later by using the card again. Nubart audio-guides are sold by the card. 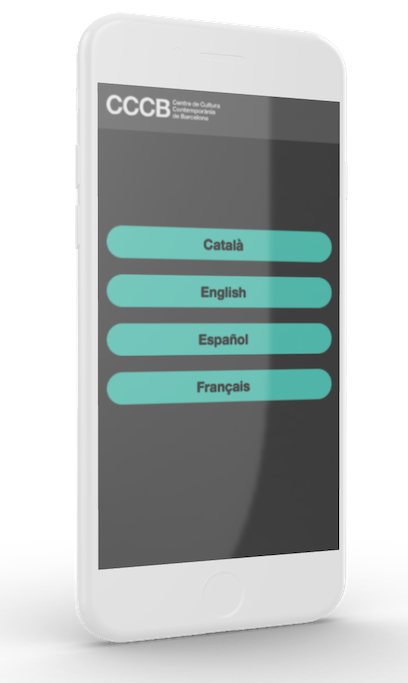 The larger the number of cards that your order, the more content (translation and voice overs) and languages will be included in the package. With our package system, your museum can easily calculate in advance the budget you need for an audio-guide for your next temporary exhibition. No surprises! Even small museums can afford a Nubart audioguide. You decide if you want to give the audio-guide cards for free to your visitors or if you prefer to sell them (at any price you choose). By selling them, you will not only quickly recover your investment (ROI), but even make a profitable business! To find out more, the best thing to do is to ask us for a quote ! 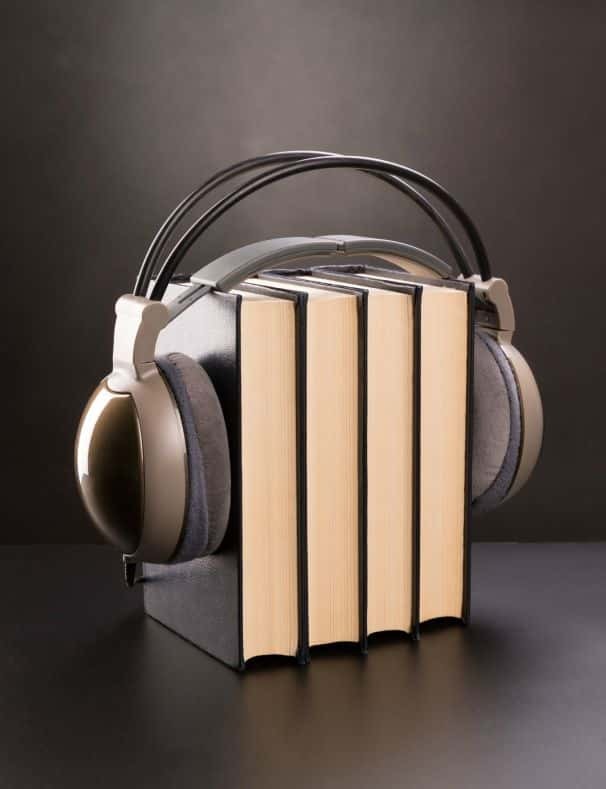 Are you an interested institution and want to better understand how Nubart audioguides work? Fill out this short form and you will receive a free sample or a quote tailored to your needs (or both). How do your audio-guide cards work? The unique codes printed on our cards work like a key which provides the owner exclusive access to all the digital content. To access the content, the visitor scans the QR code or (if he/she is not familiar with how to use QR codes) enters a code on the museum's website. Nubart has developed a unique combination of transactional cookies + opt-in system called LOCP (patent pending) to provide non-transferable access to digital content. Thanks to LOCP, the owner of the card can access the audio-guide as often as she wants, from her smartphone, other device, or from a PC -- even months or years later. But the card cannot be used by anybody else. This way we ensure that the audio cards have commercial viability and we guarantee the high quality of the anonymous data we collect from visitors to the museum. Is it necessary for my museum to have free Wifi to offer Nubart audio guides? Our audio-guide tracks are streamed, so only the tracks chosen by the visitor to listen to consume data (unlike most apps that force you to download all the content at once). The data consumed by the chosen tracks is 0.46 MB per minute: 1/5 that of music services like Spotify. Given this low data consumption, provided the overall mobile data coverage is good, we don’t consider it essential to provide free Wifi to offer our audio-guides. Particularly considering that since June 2017 EU-citizens are no longer subject to roaming fees. 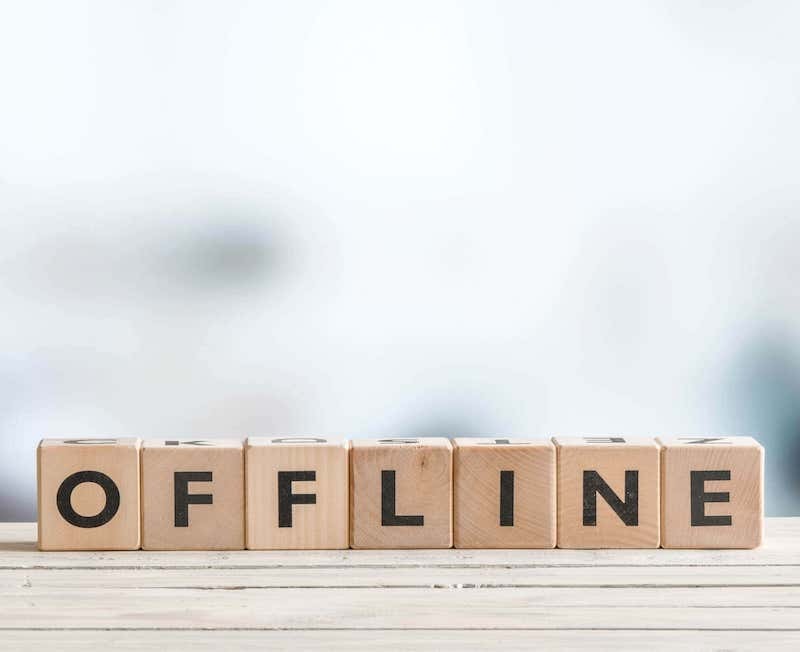 However, for cases of complicated connectivity (museums that only have Wifi in the reception area, or audio-routes in natural spaces with little or no connectivity) we have developed an offline mode. This mode can download all the sound tracks to the temporary memory of your device. Thus, once downloaded, you can keep listening in areas without coverage. As always with Nubart, all this without downloading any app! What do you need to produce an audioguide? We know that most museums suffer from a shortage of staff and have a very high workload. Our goal is to take this burden from you. In general, we only need a script, pics and some information. We take care of everything else, keep you informed about the process and seek your approval in the different stages. How can I distribute/sell audio-guides to my visitors? Museums have flexibility to choose any model of distributing Nubart cards to their visitors. Give away for free as a promotion to bring more visitors (ex. on certain days). Give away for free as part of a sponsorship partnership. Give away for free as part of the entrance fee (highly recommended!). Sell the guides at a price which covers costs/investment. Sell the guides at a profit. Because the museum has complete control of pricing to visitors, Nubart cards make experimenting to find the perfect mix easy. Remember, the more the cards are used, the greater the amount of data and feedback from visitors about the museum's collection or exhibits is gathered. Are Nubart cards environmentally friendly? Cards made from high-strength special cardboard, FSC certified. Bio-PVC: these cards contain an additive called Add-X Biotech which makes them biodegradable after a few years. The QR-code con the cards is printed with a slight relief, so that visually impaired people can detect its presence and its location with the fingertips and capture it with the QR-scanner on their smartphones. Our in-house CMS has been developed in universal design and is inclusive. Should I offer headphones together with Nubart cards? Usually your visitor will use her own headphones or reduce the volume of her smartphone to a minimum to not bother other visitors. But if you think that headphones are a must in your museum, we can gladly provide them, and also customize the packaging with your logo, as you see in this image.Ask us for a quote! Founded in Barcelona in 2013, the mission of our company Digital Tangible SL has always been to make digital content tangible. After launching our download cards for eBooks and audiobooks under Seebook, we developed Nubart in 2016. With Nubart, we are empowering small and medium museums all around the world to offer profitable audio-guides to thousands of visitors. This retrospective exhibition of the great artist Gerardo Chávez has been our first commission in Peru. 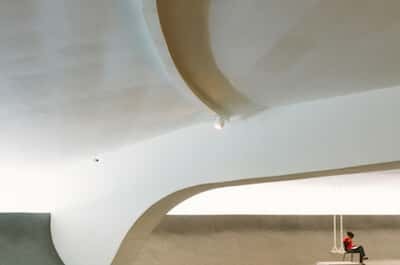 All tracks (in Spanish) have been recorded by the artist himself, guiding the visitor around the exhibition. With the sponsorship of Claro.